Famed for its love of cricket, relaxed lifestyle and local charm, the once British colony of Barbados is the eastern-most and perhaps the most colourful and varied of the Caribbean islands. Enjoying a beautiful summer climate that is timed perfectly for the UK school holidays, as well as fresh Atlantic breezes that help keep the temperatures manageable, Barbados boasts a host of attractions that make it perfect for a family escape. Once endangered by overfishing, sea turtles now enjoy a position of respect in Barbados and the island hosts a healthy population of these graceful Caribbean icons. The leatherback and hawksbill sea turtles are a beautiful attraction for snorkellers and scuba divers and, as many of the turtles have become quite used to the presence of humans, you can really get up close to enjoy watching them glide effortlessly through the water. While at times it seems as though they welcome the attention, divers are encouraged to keep their distance and refrain from touching them. During the breeding season, moonlight cruises are excellent ways to see turtle hatchlings make their first journey from the nest to the sea. As one of the most ancient creatures on Earth, at least seven species are thought to be as old as the dinosaurs, Barbados takes the protection of the turtles very seriously. In 1987, the Barbados Sea Turtle Project (BSTP) was started to conserve the seas and preserve their nesting sites and today their protection is shared across the community. In a twist of fate, many fishermen care for the turtles by feeding them, assisting with tagging programs, scraping barnacles from their shells and helping to ensure their nests are kept safe. Like its Caribbean sister islands, Barbados is known for the most amazing, palm tree-lined beaches. While all of them are fantastic, each of them has its own individual character and charm. Although it sits on the Atlantic Ocean side of the south east coast, Crane Beach is generally considered one of the best beaches on Barbados with a wide stretch of palm-fringed, white sand and medium-sized waves for anyone who fancies a go at surfing or bodyboarding. Waves can sometimes be a little high for very young children but it is generally a great beach for families and picnics. Sandy Lane is a hidden-away stretch of wide, beautiful sand that is ideal for walks in the evening with a rocky end that generates medium surf that is popular with intermediate surfers and water sports enthusiasts. Water sports can be booked directly from one of the beach vendors. 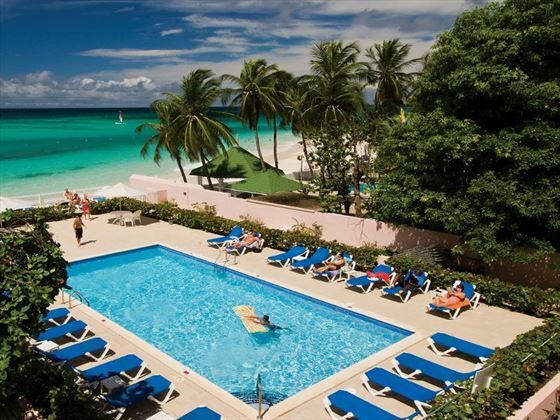 Ju Ju’s is perfect for swimming; a wide, safe beach located on the west coast of Barbados. A reef close to the shore encourages sea turtles and other marine life, making it great for snorkelling and scuba. You can rent umbrellas at the popular Ju Ju’s Beach Bar or just settle down into a lounger with a cocktail. Accra Beach is the most popular on the south coast and is ideal for small children thanks to a manmade groyne which helps keeps the waves small. Barbados boasts some amazing kids’ clubs that offer a range of activities to keep both young and older children entertained during their holiday, allowing mum and dad to enjoy theirs as well. Turtle Beach by Elegant Hotels operates The Flying Fish Kids’ Club, which is open from 9am to 9pm, and is focused on children aged three to 12-years-old. It offers a wide range of indoor and outdoor games such as beach cricket, table tennis, themed parties, movie nights and karaoke. Bourgainvillea Beach Resort includes child-friendly accommodation, babysitting services, children’s menus and a host of activities that include; water sports, a games room with a huge 57” TV for movies and games and Adventureland Playroom, which is ideal for children under 12-years-old. Cobblers Cove offers a complimentary range of activities for children from 8 July to 4 September that includes; sailing lessons, water sports, swimming with turtles, arts and crafts and an additional babysitting service. The Colony Club has a paddle boarding clinic that is sure to be a hit with teenagers and older children looking to try something new. The snorkelling at Mango Bay is some of the best on Barbados and the beach is relaxing curve of beautiful white sand, safe and ideal for children.